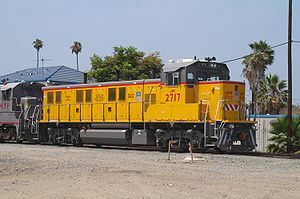 The NRE 3GS21B is a low-emissions diesel switcher locomotive built by National Railway Equipment. It is powered by three Cummins QSK19C I6 engines with each one developing 700 horsepower (522 kW) and creating a total power output of 2,100 horsepower (1,570 kW). Having multiple engines instead of a single prime mover, a design referred to as a "Genset," reduces overall diesel emissions and improves fuel efficiency. More than 150 of the 3GS21B Genset locomotives have been produced to date, with the majority of these units being manufactured at NREC's Mount Vernon shops in Southern Illinois. In addition, three road slug models have also been produced. The result is a model that will accelerate the first set until notch 3-4 transition and then start up the next set and accelerate through the 2 additional notches and then start up the next set.